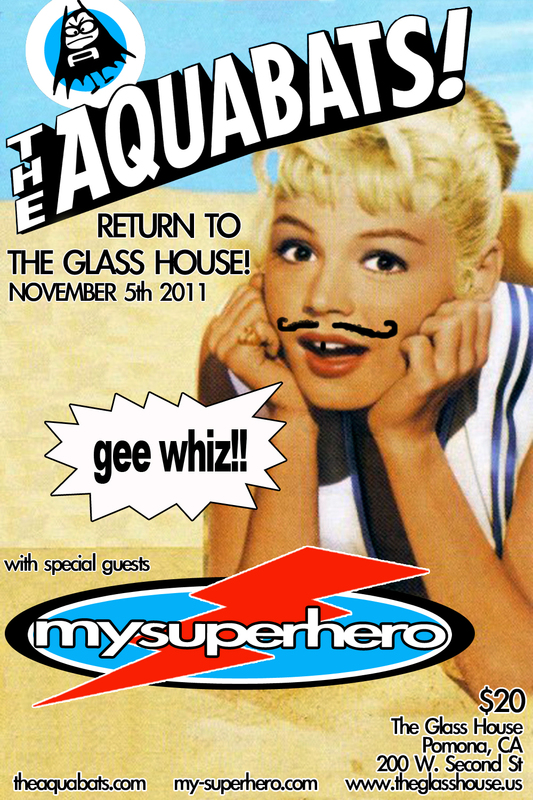 I’m trying to think of the last time we played with the Aquabats… 1998 maybe? We did a national tour with them in 1998 and I can honestly say we had more fun than any other time on the road. So many hilarious stories and seriously the reason I met my wife. We first met the Aquabats back in 1994 at a tiny place in Fullerton called Cafe Nove. 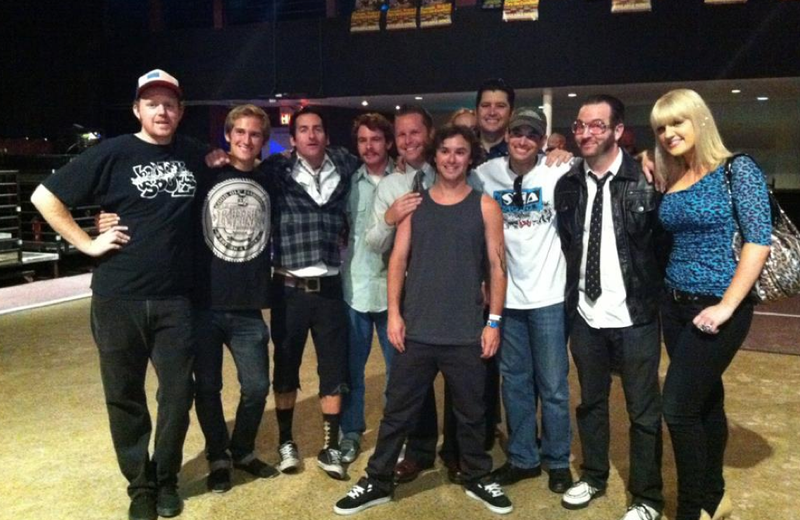 From there on out- we played dozens of shows with The Aqua Bats and Reel Big Fish. It was a common sight to see all 3 bands on the same night back in those days. 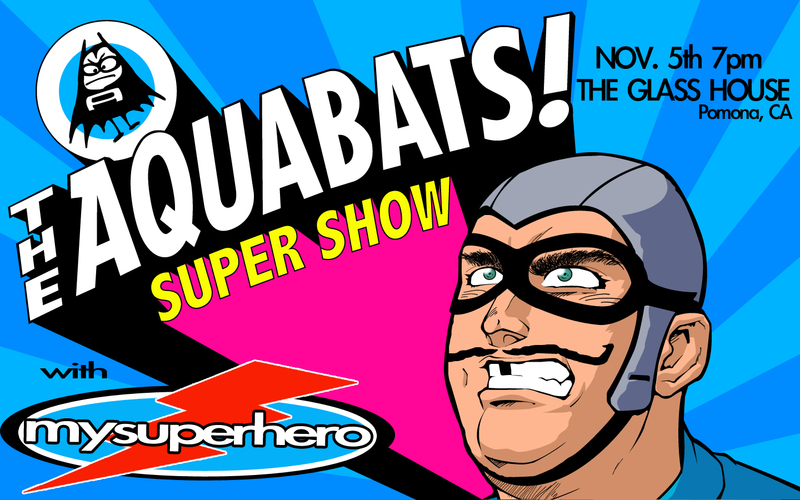 I’m sure you have all followed the success of Yo Gabba Gabba and if you have been living under a rock- the release of their very own “AQUABATS SUPER SHOW” coming this fall on the HUB network. We are so excited to be part of this show on Nov. 5th and can’t thank the Bats enough for asking us to play with them after 11 years. My Superhero flies again! New show just confirmed! I want to say the last time we played with the bats was during their national tour in 1998. Good friends, good times! We played together for the first time back in 1994 at Cafe Nove in Fullerton! Buy your tickets asap- this will sell out in the next few days. Make sure to RSVP on our event page on Facebook. Support your local superhero! I was digging through some old boxes and came across a VHS tape. I thought this footage was long gone! Stoked! My Superhero live on the Gong Show 1998 from Jennifer Gilmore on Vimeo. Tazy Phyllipz (skaparade.com) OC Ska legend, DJ, MC, ska historian – for having the vision of a reunion show and making it happen. Jon Halprin (glasshouse.us) Long time friend, owner of Vegas Records, and promoter at the glasshouse – for believing in us and allowing the show to the held at the Glasshouse. 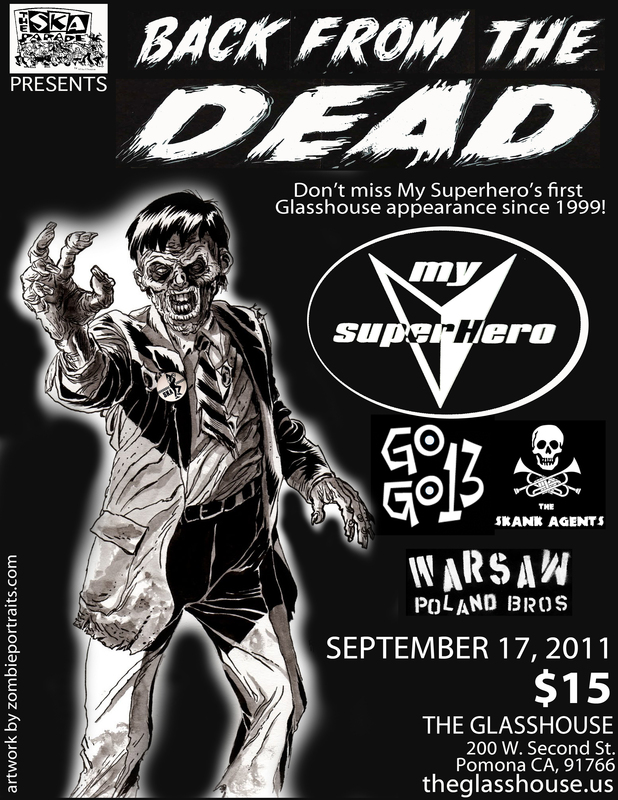 To GOGO13, The Skank Agents, and Warsaw Poland Bros for rocking with us! to all of our friends and family who drove out, flew in from all over to be with us that night. So much love and support from you all- HUGE THANKS!! Here is a great review we received from Highwire Daze. Thanks to JD and Ken for rocking this music magazine for 20 years! The Ska Parade has always presented the most exciting events in the genre, including being host to some interesting reunion shows. A long time project of Tazy Phyllips, who exudes a refreshingly genuine passion for the genre, The Ska Parade has been going on for some 20 years now. Tazy definitely made for a wonderful master of ceremonies for the evening, introducing all of the bands and giving the audience interesting back-stories in the process. 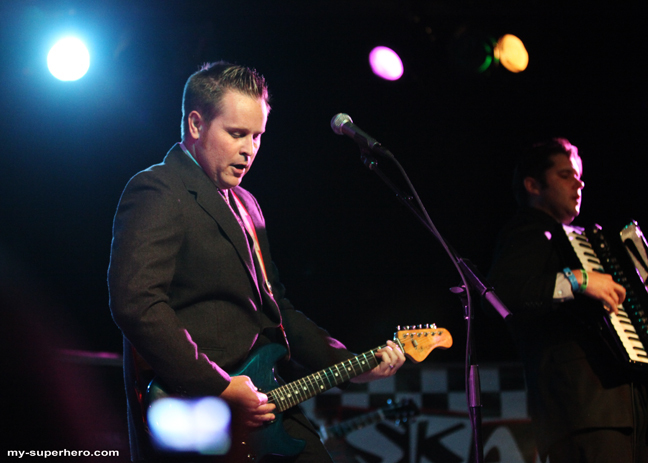 There were many notable ska bands who have called Orange County their home. Thanks to Tazy, one such entity, My Superhero, was doing a their first show since 2003! My Superhero were around nearly a decade, performing two tours of duty at the famed Vans Warped Tour. The band also went on endless road trips supporting famous bands such as Reel Big Fish, The Aquabats, and Fenix TX. Although My Superhero never employed a horn section, this ska band was definitely noted for the rambunctious accordion playing of Mike Berault. Tazy would contact Mike first about doing a My Superhero reunion show, and then was instructed to contact the others within the membership. Amazingly, all were willing to do the reunion show, except for drummer Chris Clawson, who was unavailable to participate. Tim Bivens was recruited via a recommendation by another former My Superhero member. Already knowing the songs since Tim was a long time fan who went to My Superhero shows when he was all of 12; the reunion lineup was now complete. Two months of rehearsals commenced, and My Superhero performed to a near packed house at The Glasshouse in Pomona on a Saturday night. The memories of good times and groovin’ tunes kicked in right away when My Superhero launched into their first song One More Day from their classic Solid State 14 release. In addition to their own original favorites, there were a few terrific covers within the set as well. Big City by Operation Ivy was given a grand heroic treatment, and Groovy Kind Of Love by Phil Collins was a crowd favorite as well. The band was clearly not fond of their Station One release, and performed a single track from the album – Best Days sounded absolutely terrific though, and should have been a big hit for the band. An amusing part of the show arrived when the song Coley and Steve was introduced from the debut SKAboard Music release – where Mike Berault advised the crowd to never write a song about a relationship with an ex – as you are doomed to sing and relive it over and over again if people like it. And it definitely was a crowd favorite at the Glasshouse! Another standout was towards the end of the set, when My Superhero performed the super infectious rendition of the Camper Van Beethoven song Take The Skinheads Bowling. A recorded version of this song is featured on The Ska Parade: Running Naked Thru The Cornfield compilation. So many memories were brought back to ultra vivid life, and My Superhero was as tight and entertaining as ever. Grocers Pride, Going Somewhere, Leaving Soon, Long Gone – the memorable tunes just kept on coming at you! Brian Gilmore is a charismatic front man, and his voice and guitar playing are an energetic and lively as ever. Mike Berault remains a rambunctious character to this day, also performing smooth lead vocals as well as the famous accordion solos and keyboards interludes. The harmonies the two vocals leads supplied were dazzling and inspired. 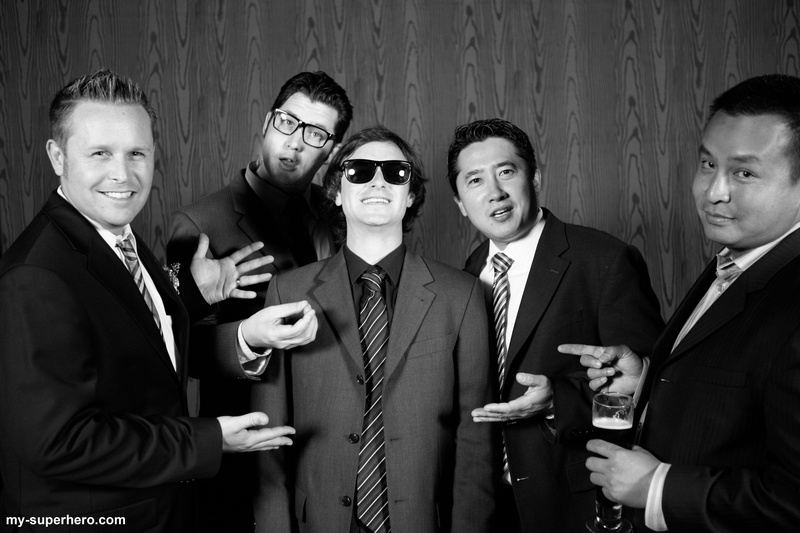 Huey Huynh on guitar and Dan Park bass delivered their parts with flair and conviction while newest member of the My Superhero club Tim Bivens fit right in with his wonderfully dynamic playing. Will there be any addition My Superhero performances? Only time will tell, but judging by the crowd in attendance who cheered and danced to each and every song, the band should definitely consider their options. A truly magical night in Pomona! Special thanks to Tazy Phyllips of The Ska Parade for arranging the reunion! 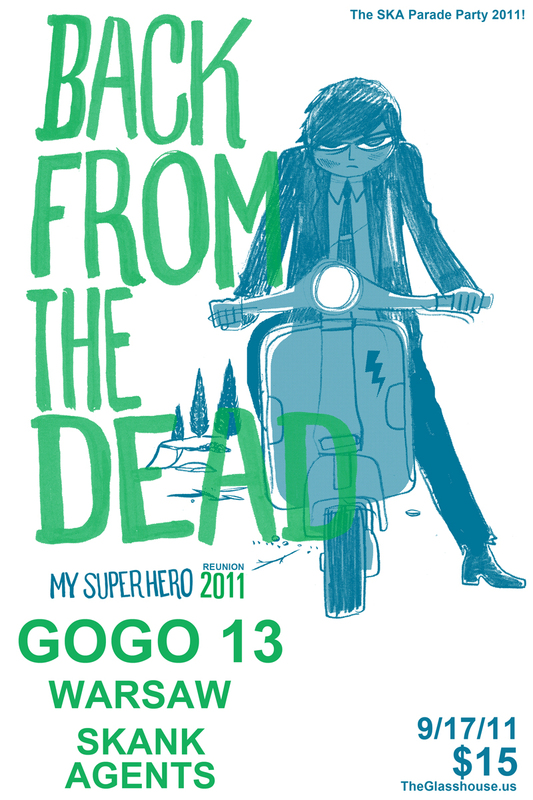 My Superhero has truly been missed and remains one of the top bands in the 3rd wave of OC ska! The big show is tomorrow! Make sure you get there early- doors are at 6pm and MSh goes on around 930pm. The show is being filmed so go crazy if you see a camera! If things weren’t already hectic enough- members of My Superhero were asked to perform a super-secret couple of songs for their long time friend/manager/merch guy/booking agent/record label intern Sam Uisprapassorn. We go way back with Sam and were honored to be part of the festivities. Same dedicated many years to MSh and we always considered him to be a member of the band. It was a good test run to what a live show might be like. Mike didn’t have his accordion so he looked a little out of sorts but the rest of us did well. It was also a great pressure test for Tim Bivens on the drums! Congrats to Sam & Cara! I am also proud to announce that My Superhero is now officially recorded on internet history. Yes, you can now find your local superhero’s on wikipedia! Took a little bit of research but we are there.